Journalist Pete Fernandez (Silent City, 2016) hits rock bottom when he confronts a serial killer. Since getting fired by the Miami Times, Pete’s divided his time between helping his friend Dave Mendoza at The Book Bin and drinking himself senseless. Still, he’s not too addled to miss his second chance with former fiancee Emily Sprague when she leaves her husband, Rick Blanco. Since she can’t get over Rick’s cheating on her with his 20-something office assistant, Alice Cline, Emily moves into Pete’s guest room while she decides what to do next. What Alice does next is disappear, bringing the police to Rick’s door. When Alice’s body is found sliced and diced in the style of serial killer Rex Whitehurst, the cops go ballistic. It can’t be Rex, who was executed years ago in front of scores of witnesses. Once Pete and Times crime reporter Kathy Bentley decide to investigate, things get ugly. Someone roughs up Pete and firebombs his house. Emily returns to Rick, sending Pete, who’s just started attending AA meetings, right off the wagon. More women are snatched, and more mutilated bodies turn up. Even the FBI seems stymied. 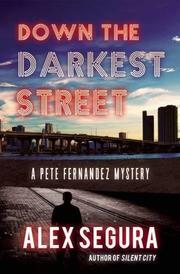 The deeper Pete digs, the more the killer focuses his rage on him, until no one in his orbit is safe. Segura can’t quite decide between noir and creep show. Pete’s second case may not tempt fans of either.